Reception of the American Loyalists by Great Britain in the Year 1783. The engraving depicts Loyalists seeking aid from Britannia following their expulsion from the United States. United Empire Loyalists (or simply Loyalists) is an honorific which was first given by the 1st Lord Dorchester, the Governor of Quebec, and Governor-General of the Canadas, to American Loyalists who resettled in British North America during or after the American Revolution. The Loyalists were also referred to informally as the "King's Loyal Americans". At the time, the demonym Canadian or Canadien was used to refer to the indigenous First Nations groups and the French settlers inhabiting the Province of Quebec. They settled primarily in Nova Scotia and the Province of Quebec (including the Eastern Townships, and Montreal). The influx of loyalist settlers resulted in the creation of several new colonies. In 1784, New Brunswick was partitioned from the Colony of Nova Scotia after significant loyalist resettlement around the Bay of Fundy. The influx of loyalist refugees also resulted in the Province of Quebec's division into Lower Canada (present-day Quebec), and Upper Canada (present-day Ontario) in 1791. The Crown gave them land grants of 200 acres (81 ha) per person to encourage their resettlement, as it especially wanted to develop the frontier of Upper Canada. This resettlement added many English speakers to the Canadian population. It was the beginning of new waves of immigration that established a predominantly English-speaking population in the future Canada both west and east of the modern Quebec border. 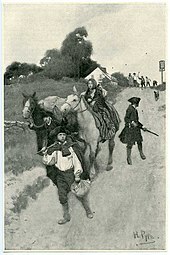 Depiction of Loyalist refugees on their way to the Canadas during the American Revolution. Following the end of the American Revolutionary War and the signing of the Treaty of Paris in 1783, both Loyalist soldiers and civilians were evacuated from New York City, most heading for Canada. Many Loyalists had already migrated to Canada, especially from New York and northern New England, where violence against them had increased during the war. The Crown-allotted land in Canada was sometimes allotted according to which Loyalist regiment a man had fought in. This Loyalist resettlement was critical to the development of present-day Ontario, and some 10,000 refugees went to Quebec (including the Eastern Townships and modern-day Ontario). But Nova Scotia (including modern-day New Brunswick) received three times that number: about 35,000–40,000 Loyalist refugees. These included some 3,000 Black Loyalists, slaves who had gained freedom from the British for working with them during the war. At the same time, some white Loyalists in Nova Scotia had brought their slaves with them, and held them until slavery was abolished in 1834. Prince Edward Island received 2,000 refugees. An unknown but substantial number of individuals did not stay; they eventually returned to the United States. As some families split in their loyalties during the war years, many Loyalists in Canada continued to maintain close ties with relatives in the United States. They conducted commerce across the border with little regard to British trade laws. In the 1790s, the offer of land and low taxes, which were one-quarter those in the Republic, for allegiance by Lieutenant-Governor Simcoe resulted in the arrival of 30,000 Americans often referred to as Late Loyalists. By the outbreak of the War of 1812, of the 110,000 inhabitants of Upper Canada, 20,000 were the initial Loyalists, 60,000 were later American immigrants and their descendants, and 30,000 were immigrants from the UK, their descendants or some Quebecois. The later arrival of many of the inhabitants of Upper Canada suggests that land was the main reason for immigration. The arrival of the Loyalists after the Revolutionary War led to the division of Canada into the provinces of Upper Canada (what is now southern Ontario) and Lower Canada (today's southern Quebec). They arrived and were largely settled in groups by ethnicity and religion. Many soldiers settled with others of the regiments they had served with. The settlers came from every social class and 13 Colonies unlike the depiction of them in the Sandham painting which suggests the arrivals were upper-class immigrants dressed in their best and about to go the Ball. The Coming of the Loyalists, painting by Henry Sandham showing a romanticised view of the Loyalists' arrival in New Brunswick. Loyalists soon petitioned the government to be allowed to use the British legal system, which they were accustomed to in the American colonies, rather than the French system. Great Britain had maintained the French legal system and allowed freedom of religion after taking over the former French colony with the defeat of France in the Seven Years' War. With the creation of Upper and Lower Canada, most Loyalists in the west could live under British laws and institutions. The predominately ethnic French population of Lower Canada, who were still French-speaking, could maintain their familiar French civil law and the Catholic religion. Because most of the nations of the Iroquois had allied with the British, which had ceded their lands to the United States, thousands of Iroquois and other pro-British Native Americans were expelled from New York and other states. They were also resettled in Canada. Many of the Iroquois, led by Joseph Brant Thayendenegea, settled at Six Nations of the Grand River, the largest First Nations Reserve in Canada. A smaller group of Iroquois led by Captain John Deserontyon Odeserundiye, settled on the shores of the Bay of Quinte in modern-day southeastern Ontario. 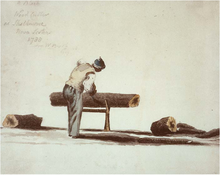 A Black Loyalist wood cutter at Shelburne, Nova Scotia in 1788. The government settled some 3,500 Black Loyalists in Nova Scotia and New Brunswick, but they faced discrimination and inadequate support. Delays in making land grants aggravated racist tensions in Shelburne. Mobs of white Loyalists attacked Black Loyalists in the Shelburne Riots in July 1784, Canada's first recorded race riot. The government was slow to survey the land of Black Loyalists (which meant they could not settle); it also was discriminatory in granting them smaller, poorer and more remote lands than those of white settlers. This increased their difficulties in getting established. The majority of Black Loyalists in Canada were refugees from the South; they suffered from the harsh winters and discrimination. When Great Britain set up the colony of Sierra Leone in Africa, nearly 1300 Black Loyalists emigrated there in 1792 for the promise of self-government. The Black Loyalists established Freetown in Sierra Leone. Well into the 20th century, together with other early settlers from Jamaica and slaves liberated from illegal slave ships, they and their descendants dominated the culture, economy and government of Sierra Leone. Numerous Loyalists had been forced to abandon substantial amounts of property in the United States. Britain sought restoration or compensation for this lost property from the United States, which was a major issue during the negotiation of the Jay Treaty in 1795. Negotiations settled on the concept of the United States negotiators "advising" the U.S. Congress to provide restitution. For the British, this concept carried significant legal weight, far more than it did to the Americans; the U.S. Congress declined to accept the advice. The Act Against Slavery, 1793, an anti-slavery act passed in Upper Canada. The Act was created partially in response to Loyalist refugees who brought slaves with them. Slave-owning Loyalists from across the former Thirteen Colonies brought their slaves with them to Canada, as the practice was still legal there. They took a total of about 2,000 slaves to British North America: Some 500 in Upper Canada (Ontario), some 300 in Lower Canada (Quebec), and 1,200 in the Maritime colonies of New Brunswick, Nova Scotia, and Prince Edward Island. The presence and condition of slaves in the Maritimes would become a particular issue. They constituted a larger portion of the population, but it was not an area of plantation agriculture. The settlers eventually freed many of these slaves. Together with the free Black Loyalists, many chose to go to Sierra Leone in 1792 and following years, seeking a chance for self-government. Meanwhile, Britain passed an imperial law in 1790 that assured prospective immigrants to Canada that they could retain their slaves as property. In 1793, an anti-slavery law was passed, in the 1st Parliament of Upper Canada. The Act Against Slavery, banned the importation of slaves into the colony, and mandated the emancipation of all children born henceforth to female slaves upon reaching the age of 25. The Act was partially introduced due to the influx of the number of slaves brought by Loyalist refugees to Upper Canada. Trading was abolished across the British Empire in 1807. The institution of slavery was abolished Empire-wide by 1834 (except in India, where it was considered an indigenous institution). 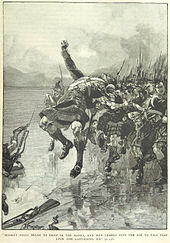 Depiction of Glengarry Light Infantry's charge across a frozen river during the Battle of Ogdensburg. The unit's membership was restricted to Loyalist and British settlers. From 1812 to 1815, the United States and the United Kingdom were engaged in a conflict known as the War of 1812. The outbreak of the war was a result of British wartime policies in their conflict against Napoleonic France. On 18 June 1812, the United States President James Madison signed the declaration of war into law, after receiving heavy pressure from the War Hawks in Congress. By 1812, Upper Canada had been settled mostly by Revolution-era Loyalists from the United States (United Empire Loyalists) or postwar American and British immigrants. 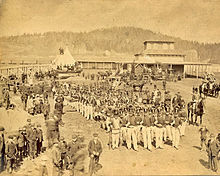 The Canadas were thinly populated and only lightly defended by the British Army, and the sedentary units of the Canadian Militia. American leaders assumed that Canada could be easily overrun, with former American President Thomas Jefferson optimistically stating the conquest of Canada as "a matter of marching". Many Loyalist Americans had migrated to Upper Canada after the Revolutionary War. However, there was also significant number of non-Loyalist American settlers in the area due to the offer of land grants to immigrants. The Americans assumed the latter population would favour the American cause, but they did not. Although the population of Upper Canada included recent settlers from the United States who had no obvious loyalties to the Crown, the American forces found strong opposition from settlers during the War of 1812. A number of loyalists served as fencibles, the Provincial Marine, provincial regulars, or with the sedentary militia. With the successful defence of the Canadian colonies from American invasion, the War of 1812 is seen by Loyalists as a victory. After the war, the British government transported to New Brunswick and settled about 400 of 3000 former slaves from the United States whom they freed during and after the war. It had fulfilled its promise to them of freedom if they left slaveholders and fought with the British. Enslaved African Americans risked considerable danger by crossing to British lines to achieve freedom. While the honorific "United Empire Loyalist" is not part of the official Canadian honours system, modern-day descendants of Loyalist refugees may employ it, sometimes using "U.E." as postnominal letters. The practice, however, is uncommon today, even in original Loyalist strongholds like southeastern Ontario. Historians and genealogists use it extensively as a shorthand for identifying the ancestry of particular families. Gathering for the Loyalist Centennial Parade in Saint John, New Brunswick in 1883. The influence of the Loyalists on the evolution of Canada remains evident. Their ties with Britain and antipathy to the United States provided the strength needed to keep Canada independent and distinct in North America. The Loyalists' basic distrust of republicanism and "mob rule" influenced Canada's gradual, "paper-strewn" path to independence. The new British North American provinces of Upper Canada (the forerunner of Ontario) and New Brunswick were created as places of refuge for the United Empire Loyalists. The mottoes of the two provinces reflect this history: Ontario's, also found on its coat of arms, is Ut incepit fidelis sic permanet ("Loyal she began, loyal she remains"); New Brunswick's, Spem Reduxit ("Hope restored"). The word "Loyalist" appears frequently in school, street, and business names in such Loyalist-settled communities as Belleville, Ontario. The nearby city of Kingston, established as a Loyalist stronghold, was named in honour of King George III. And on the outskirts of that city is a township named simply "Loyalist". 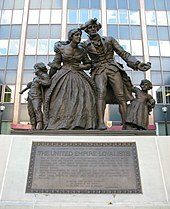 On 1 July 1934, Royal Mail Canada issued "United Empire Loyalists, 1776–1784" designed by Robert Bruce McCracken based on a sculpture "United Empire Loyalists" by Sydney March. The 10¢ stamps are perforated 11 and were printed by British American Bank Note Company. In 1996, Canadian politicians Peter Milliken (a descendant of American Loyalists) and John Godfrey sponsored the Godfrey–Milliken Bill, which would have entitled Loyalist descendants to reclaim ancestral property in the United States which had been confiscated during the American Revolution. The bill, which did not pass the House of Commons, was intended primarily as a satirical response to the contemporaneous American Helms–Burton Act. In 1997, the Legislative Assembly of Ontario passed a bill declaring 19 June, "United Empire Loyalist Day" in the province of Ontario. United Empire Loyalist Day is also celebrated on the same day in Saskatchewan, on 18 May in New Brunswick and 22 July in British Columbia. Monument by Sydney March to the United Empire Loyalists in Hamilton, Ontario. 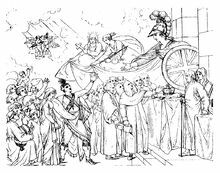 The elite origins of the refugees, their loyalty to the British Crown, their suffering and sacrifice in the face of hostile conditions, their consistent anti-Americanism, and their divinely inspired sense of mission. 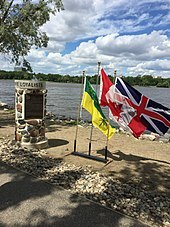 A cairn, located in Regina's Wascana Park, contains fieldstones from Saskatchewan homesteads settled by Loyalist descendants. in using their history to justify claims to superiority, descendants of the Loyalists abuse the truth and actually diminish their status in the eyes of their non-Loyalists neighbours ... The scholars who argue that the Loyalists planted the seeds of Canadian liberalism or conservatism in British North America usually fail to take into account not only the larger context of political discussion that prevailed throughout the North Atlantic world, but also the political values brought to British North America by other immigrants in the second half of the 18th century. From the 1870s their descendants returned to the United States in the hundreds of thousands among the 5.5 million immigrants from Canada to the US (among whom were recent British immigrants, French Canadians, descendants of later immigrants to Canada) who settled all over the US. In the New England States alone 10% of the population can trace its roots to the Maritime Provinces (and 2 million more of 14 million inhabitants is part or wholly French Canadian). The United Empire Loyalists' Association of Canada (UELAC) is an organization of Loyalist descendants and others interested in Canadian history, in particular the role of the United Empire Loyalists (UEL). With UELAC branches all across Canada and an annual conference held in different cities across the country each year, an active membership keeps this period of Canadian history memorialized. 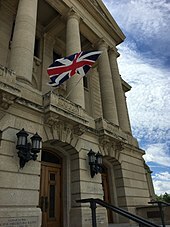 The Loyalist Flag flies over the Saskatchewan Legislative Building on UEL Day. On April 17, 1707, Queen Anne issued a proclamation referencing the use of the Union Flag "at Sea and Land". The Union Flag began to appear on forts and as regimental colours from this point, and at the time of the American Revolution, this was the flag in use. When those loyal to the Crown left the United States for British North America, they took this flag with them, and because of this historical connection, it continues to be the official flag of the UELAC. The Union Flag is composed of the Cross of St. George, a horizontal and vertical red cross on a white background, and St. Andrew's Cross, a diagonal white cross on a blue background. The crosses of St. George and St. Andrew represent England and Scotland respectively. In Canadian heraldry, Loyalist descendants are entitled to use a Loyalist coronet in their coat of arms. 18th-century names are listed first, alongside their present-day equivalents. ^ Wilson, Bruce G.; Foot, Richard (4 March 2015) [2 April 2009]. "Loyalists". The Canadian Encyclopedia (online ed.). Historica Canada. ^ Orkin, Mark M. (2010). "The Name Canada: An Etymological Enigma". In Elaine Gold; Janice McAlpine (eds.). Canadian English: A Linguistic Reader (PDF). Strathy Language Unit, Queen's University. pp. 38–43. Archived (PDF) from the original on 24 September 2015. ^ Bell, David (2015). American Loyalists to New Brunswick: The ship passenger lists. Formac Publishing Company. p. 7. ISBN 978-1-4595-0399-1. ^ Careless, James Maurice Stockford; Tattrie, Jon (24 July 2015) [7 February 2006]. "Responsible Government". The Canadian Encyclopedia (online ed.). Historica Canada. Retrieved 13 November 2017. ^ Rees, Ronald. Land of the Loyalists: Their Struggle to Shape the Maritimes, Nimbus, 146 p., 2000, ISBN 1-55109-274-3. ^ E.A. Heaman (2015). A Short History of the State in Canada. U of Toronto Press. p. 74. ^ Wilson, William R. (nd). "Early Canada Historical Narratives: an Act to Prevent the Further Introduction of Slaves". Upper Canada History. Retrieved 10 February 2018. ^ Ronald J. Dale (2001). The Invasion of Canada: Battles of the War of 1812. James Lorimer & Company. p. 17. ISBN 1550287389. ^ Fraser, Robert Lochiel. "Mallory, Benajah". ^ Jones, Elwood H. "Willcocks, Joseph". ^ Kaufman, Erik (1997). "Condemned to Rootlessness: The Loyalist Origins of Canada's Identity Crisis". Nationalism and Ethnic Politics. pp. 110–135. doi:10.1080/13537119708428495. ^ "Canadian Postal Archives Database". data4.collectionscanada.gc.ca. Government of Canada. ^ Henry Coyne (1904). Memorial to the United Empire Loyalists. Publications of the Niagara Historical Society. p. 30. ^ Margaret Conrad and Alvin Finkel, History of the Canadian Peoples: Beginnings to 1867 (vol 1, 2006) p 202. ^ Conrad and Finkel, History of the Canadian Peoples: Beginnings to 1867 (vol 1, 2006) p 203. ^ "The Coat of Arms of Wainfleet Township". wainfleet.info. Bowhunter Websites. Retrieved 24 July 2013. Acheson, T.W. "A Study in the Historical Demography of a Loyalist County", Social History, 1 (April 1968), pp. 53–65. Compeau, Timothy J. "Dishonoured Americans: Loyalist Manhood and Political Death in Revolutionary America." (PhD Diss. The University of Western Ontario, 2015); online. Jasanoff, Maya. Liberty's Exiles: American Loyalists in the Revolutionary World. (Knopf, 2011) Ranlet (2014) [below] argues her estimate of the number of Loyalists is too high. Jodon, Michael. Shadow Soldiers of the American Revolution; 2009, ISBN 978-1-59629-726-5. The History Press, Charleston SC. Moore, Christopher. The Loyalists: Revolution, Exile, Settlement; 1984, ISBN 0-7710-6093-9. Richard, Chantal; Brown, Anne; Conrad, Margaret; et al. (2013). "Markers of Collective Identity in Loyalist and Acadian Speeches of the 1880s: A Comparative Analysis". Journal of New Brunswick Studies/Revue d'études sur le Nouveau-Brunswick. 4: 13–30. Walker, James W. St G. The Black Loyalists: The Search for a Promised Land in Nova Scotia and Sierra Leone, 1783–1870 (U of Toronto Press, 1992). Wallace, W. Stewart. The United Empire Loyalists: A Chronicle of the Great Migration; Volume 13 of the "Chronicles of Canada (32 volumes) Toronto, 1914. Whitehead, Ruth Holmes. Black Loyalists: Southern Settlers of Nova Scotia's First Free Black Communities (Halifax: Nimbus Publishing, 2013). Wright, Esther Clark. The Loyalists of New Brunswick (Fredericton: 1955). Knowles, Norman James. Inventing the Loyalists: The Ontario Loyalist Tradition and the Creation of Usable Pasts (University of Toronto Press, 1997). Ranlet, Philip. "How Many American Loyalists Left the United States?." Historian 76.2 (2014): 278–307. Talman, James ed. Loyalist Narratives from Upper Canada. Toronto: Champlain Society, 1946. "Letter, Benjamin Franklin to Baron Francis Maseres, June 26, 1785"
Gray, Rev. J. W. D. A Sermon, Preached at Trinity Church, in the parish of St. John, N. B., on 8 December 1857, by the Rev. J. W. D. Gray, D.D., and Designed to Recommend the Principles of the Loyalists of 1783. St. John, New Brunswick: J. & A. McMillan, Printers, 1857. 15 pp. Internet Archive pdf; title incorrectly gives the year as 1847. Wikimedia Commons has media related to United Empire Loyalists. This page was last edited on 23 April 2019, at 04:48 (UTC).